I finished up prepping the bottom wing skins for priming. I should be able to prime them this Friday. The light at the end of the tunnel for the wings is getting brighter and brighter! Anyways, I thought it would be a good idea to prime the rod ends before I put installed them. So I sprayed some GBP-988 on em. Hindsight being 20/20, the buildup of the primer on the rod ends and the inside of the pushtube caused too much interference for things to go back together. I should of done this moments before everything got shoved together for the final time. Avery sells a nice jig for drilling holes in tubes, but it is just a glorified piece of welded angle for $18! I like the concept, but not the price. I went hunting around the garage and found a 4" long piece of thing angle from the wing jigs. I also had a drill press vice. 1 1 = $18 tool for nothing! The wood on the end acted as a stop so I knew how to position the aileron pushrod each time. OK, I measured out each pushrod, setting the #30 holes 1/4" from the end, and evenly spaced them - I think 19/32" between each hole, but check it out for yourself. I made a paper template to help me make the hole consistently. Anyways, I positioned the pushrod and let the drill press rip. One of my ASSumptions tonight was the distance on all the threaded rod ends before the tape was 1/2". I measured one and it was that way. I figured that all I needed to do was tap the rod end into the pushrod until the taper started, and voila, perfect alignment. Well, that worked great for my first one, however my second one wasn't pushed in enough and I have a possible edge distance issue here. I have a post on the VAF forums about this, and I am also going to give Vans a call on it. I will most likely get another one, but I would like to hear my options. This screwup isn't all that bad because it doesn't hold me back from moving onto the next step. I finished up the other pushrod without any issues. 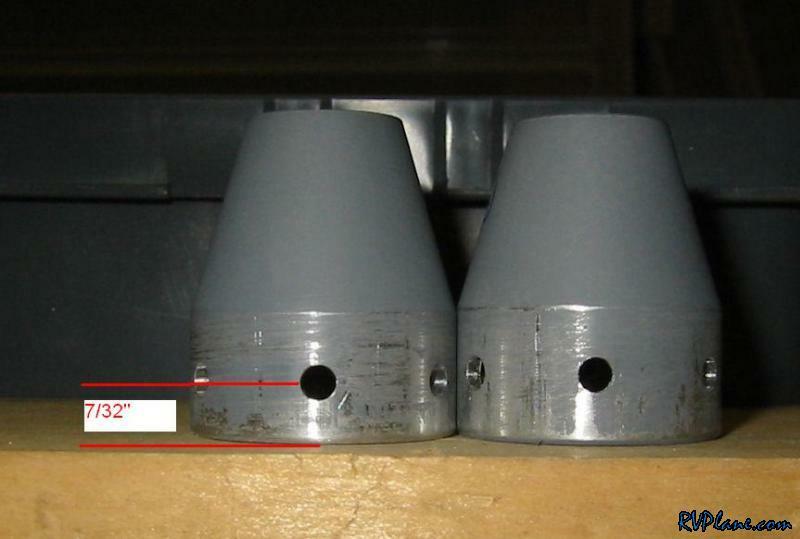 After thinking about this for 2 seconds, I also realized that I have 4 of these rod ends sitting in my fuselage box! So no time would be lost if I needed to replace them. Finally, an excuse to open up the fuse! UPDATE: I got an overwhelmingly positive response from both Ken at Van's and people on the VAF's that this isn't anything to worry about. Plus, I am within the MILSPEC acceptable range, which specifies a minimum edge distance of 0.219". I could use the rod ends I have with the fuse kit, but I would risk enlarging the holes on the pushrods and causing a bigger issue. So I am keeping with what I have.